Located on Tsing Yi island in Hong Kong, Rambler Garden offers impressive harbour views and facilities including a modern fitness room and large pool. Each room at this hotel is fully equipped with an electronic safe, free local calls, and a hairdryer. Free Wi-Fi and satellite TV take care of the entertainment. The hotel's 3,250-square metre Sky Garden offers plenty of opportunities to relax and rejuvenate. Furthermore, the arcade contains a supermarket and convenience stores. Two casual restaurants, Cafe de Coral and Fairwood, sit within a few minutes' walk of Rambler Garden. Meanwhile, So Thai So Good is a popular spot about two and a half kilometres away from the hotel, by the metro station. 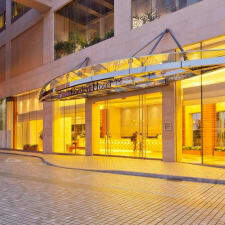 Thanks to the hotel's central location, the Disneyland Resort is less than 20-minutes' drive away, as is the Hong Kong Cultural Centre.